The photo you’re looking at above may appear to be something whipped up in Photoshop, but we can assure you that it’s 100% legit. In fact, it comes straight from Pete Souza, the Chief Official White House Photographer. Souza posted the photo online earlier today as part of a compilation chronicling the year gone by. 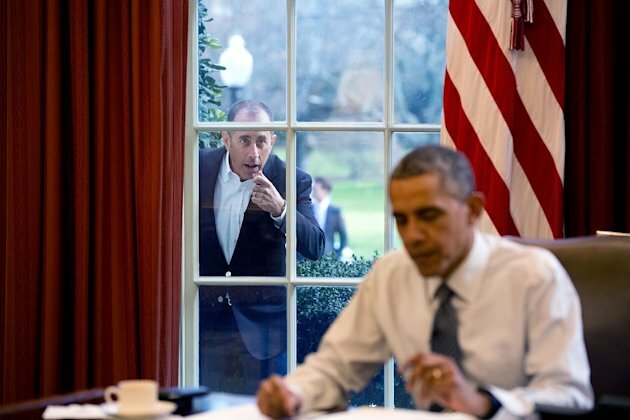 Souza’s entire photo series is definitely worth checking out in its entirety, but this particular shot of Jerry Seinfeld knocking on Obama’s Oval Office window, like a quirky sitcom neighbor, was worth highlighting. Indeed, the seventh season of the web series kicks off today at 11:30 PM Eastern. It can be streamed for free over at Crackle and is definitely worth watching if you haven’t seen it before. For those interested, a trailer for the upcoming season can be viewed below. A top candidate in the 2015 Kenya Certificate of Primary Education (KCPE) exams fainted on Wednesday after she learnt that she was leading Embu County with 424 marks. Grace Wanjiku, 13, a former pupil at Lion Primary school in Embu Town, decided to excuse herself from the rest of her family members who were watching Education Cabinet Secretary Fred Matiang’i announce the results and hid in her bedroom. Wanjiku, who wants to be a neurosurgeon, said when her mum informed her that she had topped the county, she was overjoyed and fainted. She was however resuscitated by her mother and hopes to join Alliance Girls High School. Elsewhere, a 72-year-old Kaya elder in Kwale County has scored 299 marks beating his fellow classmates at Mwamanga Primary School in Ukunda. Mzee Athuman Rimo said he once served as a local chief during President Daniel Moi’s regime. Rimo dropped out of school at standard 4 before independence during a scramble between Christian missionaries and Muslims, after which they were told not to continue with formal education because it could have led them to Christianity. According to KNEC, 937,467 candidates sat for the 2015 Kenya Certificate of Primary Education, an increase of 48,304 from last year’s 889,163 candidates. MANILA, Philippines (AP) — Philippine Roman Catholic Church officials have reprimanded a priest for riding a hoverboard and singing a song during Christmas Eve Mass. The Diocese of San Pablo, south of Manila, said the Rev. Albert San Jose apologized for his action, which was caught on video and widely shared on YouTube. The video shows the priest in a white cassock gliding up and down the church's aisles on the two-wheeled electric scooter while singing a Christmas song. Some members of the surprised congregation applaud as he pivots and moves backward. The performance came just before the final blessing in the Mass at the church in Binan city in Laguna province. "That was wrong," the diocese said in a statement late Tuesday, emphasizing that celebrating the Mass is the church's "highest form" of worship and "demands utmost respect and reverence." "It is not a personal celebration where one can capriciously introduce something to get the attention of the people," it said. The priest could not immediately be reached for comment. Philippine church officials have urged priests to live simply and humbly as they minister to the poor in the Asian bastion of Catholicism, especially under the leadership of Pope Francis, who is known for his frugal lifestyle. City Hall officials also say it is part of Kidero’s strategy to improve service delivery in Nairobi, following accusations that he has not lived up to his promise of transforming the city. Photo/FILE. NAIROBI, Kenya Dec 30 – Nairobi Governor Evans Kidero is planning to undertake a major reshuffle that will affect several top officials, in a move seen likely aimed at repositioning himself ahead of the 2017 General Election. City Hall officials also say it is part of Kidero’s strategy to improve service delivery in Nairobi, following accusations that he has not lived up to his promise of transforming the city. Sources say those likely to be affected by the changes include acting County Secretary Gregory Mwakanongo, acting Chief Finance Officer Luke Gatimu and his Treasury Chief counterpart Morris Okere. It is understood that the three have already been asked to tender resignations by the end of the week. Kidero is particularly incensed by garbage menace in Nairobi after his county government officials failed to put in place proper measures to clean up the mess. So serious is the situation that newly appointed Public Service, Youth and Gender Cabinet Secretary Sicily Kariuki directed the National Youth Service (NYS) to clean up the city. “The situation is deplorable, that is why we have decided to engage the NYS to help clean up the city,” she said on Tuesday when she launched the clean up exercise in Muthurwa market. She said officers involved in the exercise will be paid by the NYS while others engaged at the community level will be paid by the county government. A similar exercise had been launched earlier in the year by Ann Waiguru who resigned as Devolution Cabinet Secretary last month in the wake of a multi-million scandal at the NYS. Under her watch, the project had been concentrated in Kibera slum where it was launched by President Uhuru Kenyatta, and was to be extended to all other slum areas in Nairobi. It was also undertaken in Kisumu. NAIROBI, Kenya, Dec 30 – Aggrey Akhanyinya of St Joseph’s Academy in Kakamega is this year’s top candidate in the Kenya Certificate of Primary Education after scoring 449 marks out of the possible 500. “I worked very hard and you can see the results, when I grow up Iwant to become a neurosurgeon,” he said. He is followed by Wilson Muragu, Linus Munene Kirianki and Collins Kipkoech of Chelsa Academy in Bomet who tied with 446 marks. “I would like to join Alliance High School and my career aspiration is to become an Aeronautical engineer,” Collins said. Felistus Onduso of Gilgil Hills Academy who scored 445 marks is the top girl nationally followed by Naomi Gakui of Happy Land Buru Buru came third with 442. Trezzor Birhange tied with Daniel Ngira with 441 marks. Tender Care Junior Academy in Komarock is among the schools that produced the top candidates, after Osman Ali scored 440 marks. Other schools that produced candidates with high marks are Consolata Primary School, Nairobi, St. Juliana Academy, Strathmore, Kitengela, Maryhill Stead School, Nyeri among others. More than seven thousand candidates scored 400 marks and above in this year’s KCPE results released on Wednesday morning by Education Cabinet Secretary Fred Matiang’i. A total of 937,467 candidates sat this year’s KCPE examinations which were dogged by widespread cheating across the country, raising serious concerns on integrity of the exams. Under the new ranking, school names are not given as used to be the case two years ago. Matiang’i said private schools performed better in this year’s KCPE results released on Wednesday morning, although he did not give the comprehensive results which are only given to the County Education Directors. He decried the decline in public schools’ Kenya Certificate of Primary Education (KCPE) examination mean score, which went down by seven points. Candidates and parents interested in the results were asked to send their index numbers to 22252 to be able to get their scores. Matiang’i challenged the Kenya National Examinations Council (KNEC) to put in place tough measures to eliminate cheating in the examinations. “There is no shortcut in this issue, we must eliminate this nonsense,” he said. Matiang’i said that he is acting on firm instructions from President Uhuru Kenyatta to eliminate cheating in national examinations. He said the cheating menace is raising very serious concerns because it threatens the integrity and quality of the country’ education system. “We must all agree as responsible people that we must bring to this matter of examination cheating to an end once and for all,” he said. Michael Moore has never been one to hold back his opinions, so when the Oscar-winning filmmaker airs his thoughts about Donald Trump, it tends to make news. In a recent conversation with Business Insider to talk about his new movie “Where to Invade Next,” he made a bold prediction when discussing the polarizing presidential hopeful. g more and more that we've moved back into a darker time." But the progressive documentary director thinks it's impossible that Trump will become president, because, as he puts it, “81 percent of the country is either women, people of color, or youth between the ages of 18 to 31,” groups that he says Trump has alienated. (Ralph Freso/Getty Images) Donald Trump. Moore believes the selection of the next president will come down to the voter turnout by the Democrats. And right now, he sees Bernie Sanders having the edge over Hillary Clinton. A Houston mosque caught fire Friday, forcing worshippers to move to a temporary space in a shopping mall the next day. Investigators say the two-alarm blaze was set intentionally. This could be one more example of anti-Muslim sentiment in the weeks since terrorist attacks in Paris and San Bernardino, Calif. According to one poll, only 27 percent of Americans had a favorable view of Muslims. That poll was taken last year. For Muslim athletes like Oday Aboushi, the growing mistrust of people of his faith is both a disappointment and an opportunity. Aboushi, who was born in New York, has been troubled by the comments of politicians like presidential candidate Donald Trump, who proposed restrictions on Muslim immigration and has done little to tamp down anti-Muslim sentiment. "It's more alarming that a person is proposing something like this," he says. "It's such a small-minded idea. How can you punish a whole religion based off a few people? If people did that, the world will be doomed. To have a guy like that is alarming. What are his true motives? Imagine what's next, what's possible, what else is he willing to step over or on." Aboushi has a distinctly American story: his Palestinian parents were born in East Jerusalem and they emigrated to the United States – his mother to Michigan and his father to New York. Aboushi was born in Brooklyn, raised in New York City and played college football at Virginia. He washonored by the State Department in 2011 for his athletic contributions as a Muslim-American. He says part of the calling of his faith is to donate a portion of his salary to charity and he says he has done so, in addition to making trips to Sudan to help children with cleft palates. "It's a very peaceful religion," he says. "It's about helping others, treating people how you want to be treated." There aren't a great deal of prominently visible Muslim leaders in America, in politics or popular culture, and so comments from presidential candidates and pundits are passed around far more than any kind of rebuttal or clarification from actual Muslims. That has put Muslim athletes in a position of speaking for a diverse faith, and of trying to teach people that extremists and terrorists are not only outliers, but completely out of the teachings of what they believe in. Over the past two weeks, NFL players such as Ameer Abdullah and Isa Abdul-Quddus have spoken out against Trump's views. "There's a basis of innocence to [Islam]," Aboushi says. "It has a basis in humanity. But the reputation of Muslims is going to get tarnished because of the few individuals that are doing things on their own terms." President Barack Obama said in a televised speech earlier this month that Muslims "are our sports heroes," and Trump replied on Twitter with bafflement. "What sport is he talking about, and who?" Trump asked. Two of the most successful athletes in the history of American sports, Muhammad Ali and Kareem Abdul-Jabbar, are both Muslim. Both offered strong statements of rebuke. But Trump's response underscores reality: there aren't that many famous Muslims in American popular culture. "There's not the Pope for Muslims," says Amaar Abdul-Nasir, founder of the Muslim sports blogUmmahSports.net. "There's not a recognized person, where this guy is a leader of the faith, so what he says, goes." Abdul-Nasir's site, which is affiliated with MuslimMatters.org, attempts to cover Muslims in American sports, but it's not political in scope. "I wish more Muslims spoke out on social or political issues," he says, "but I don't feel comfortable saying, 'You should do this.' Because it's a complex religion, I don't expect a lot of athletes to be experts or scholars. I might not feel comfortable answering about the faith because I don't have the right answer." Some Muslims, like Abdul-Jabbar (and Abdul-Nasir), converted to the faith. Some, like Aboushi, were raised in the faith. Many conflate Muslim-Americans with Arab-Americans, but in fact the majority of Arab-Americans are Christian. Fear of "radical Islam" has in some cases overshadowed truths about Islam. Aboushi is all too familiar with this, as a blog once described him as a "Muslim extremist" and the director of the Anti-Defamation League had to make a statement to defend him. "Being pro-Palestinian does not mean you're an anti-Semite or an extremist," Abraham Foxman wrote. "The record simply does not show that Aboushi has crossed that line." Years later, it's not his own reputation on the line but that of his entire faith. "It's an unfortunate situation," Aboushi says, "but it's an opportunity to correct people and let them know what the religion is about. They're not just gonna learn. You have to take it on yourself to make them understand." Less than a year after giving Chip Kelly full personnel control in addition to his head coaching duties, the Philadelphia Eagles announced they've fired their head coach. And with that, one of the NFL's biggest experiments is over, before Kelly even completed his third season. Kelly came from the University of Oregon and was a bold hire because he had no NFL experience. He had an innovative offense that was a huge success in college. His first two seasons ended with 10 wins each, so it was hard to argue his system wasn't working. This season wasn't as successful, and the Eagles were eliminated from the playoffs with Saturday night's 38-24 loss to theWashington Redskins. That dropped the Eagles to 6-9, and had some blowout losses along the way. ESPN's Sal Paolantonio reported that Eagles owner Jeffrey Lurie wanted to strip Kelly of his personnel control, Kelly resisted, and that led to the firing. There have been rumblings all year that Kelly might get fired or leave for a college job, but ownership had been quiet about his status. Recent wins over the New England Patriots and Buffalo Bills — along with all the high-profile college coaching jobs filling up — seemed to indicate that Kelly would be around for another season. But the Eagles announced on Tuesday night that it was over and Kelly was done, effective immediately. The team said Pat Shurmur will be interim head coach for the Week 17 finale. Ed Marynowitz, vice president of player personnel, was also let go, the team said. Tom Donahoe, former Bills GM, will assume the role of senior director of player personnel, the team said. Despite a 26-21 record, the criticism of Kelly was harsh and constant this season, and most of it went back to his personnel moves in the offseason. Kelly traded fan favorite running back LeSean McCoy to the Buffalo Bills for linebacker Kiko Alonso, who has been hurt for parts of this season. He traded quarterback Nick Foles and a second-round pick for quarterback Sam Bradford, who has been inconsistent. He signed running back DeMarco Murray to a big deal, and Murray proved to be a bad fit for the offense and saw his role in the offense shrink dramatically. Other moves, like giving cornerback Byron Maxwell a huge free-agent contract, not re-signing receiver Jeremy Maclin or cutting guard Evan Mathis, haven't worked out that well either. It's surprising how impatient the Eagles were with Kelly after his first bad season. Only seven of 32 teams posted double-digit wins in 2013 and 2014, and the Eagles were one of them. But it seems now Kelly will go down as another Nick Saban or Steve Spurrier, a great college coach who is considered an NFL bust. It will be interesting to see if he ever resurfaces in the NFL, considering a 26-21 record isn't a disaster and he was in high demand after leading Oregon to a Fiesta Bowl win at the end of the 2012 season. When the Eagles hired Kelly, it was an unusual move in terms of the typical way NFL teams operate. NFL teams hire hot coordinators or retreads, mostly. They rarely hire coaches from college who run a non-traditional scheme, and almost never hire someone with no NFL experience. That's what made Kelly such an out-of-the-box hire. Don't expect another NFL team to make a similar hire for a long, long time. The Eagles' big experiment didn't work out. I have made a decision to release Chip Kelly this evening. I spent the last three seasons evaluating the many factors involved in our performance as a team. As I watched this season unfold, I determined that it was time to make a change. As we move forward, the search for a new head coach will begin and will be led by myself, Don Smolenski and Howie Roseman. To the extent that we are able, we will try to keep you informed as we go through this process. Pat Shurmur will be our interim coach for the Giants game Sunday. We have also released Ed Marynowitz, vice president of player personnel. Tom Donahoe, who has been our senior football advisor since 2012, will assume the role of senior director of player personnel. I am determined and excited to select a new coach to help us obtain our ultimate goal. Thank you for your consistent and enthusiastic support. It is always appreciated. ALPHABETICAL LIST OF COUNTIES IN KENYA. Will Ted Cruz's momentum in Iowa last? New message from ISIS leader?